October | 2010 | Wir sind bettler. Hoc est verum. 1 Timothy 3:2a “Now the overseer must be above reproach”. 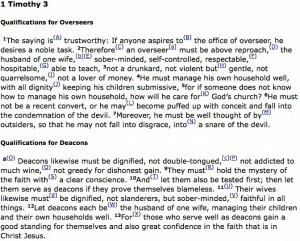 Recently there has been some discussion in the world I walk in as to what being “above reproach” means, specifically for us leaders in the church, namely for Elders and Pastors (of which I am neither). Set in the context of some “super” sin, what does it mean to be “above reproach” (although I believe that the Bible teaches degrees of sin, there is a sense in which all sins are “super” since they offend a Holy God, what I mean by “super” is essentially the sins God seemingly point out as greater: murder, adultery, theft, etc. 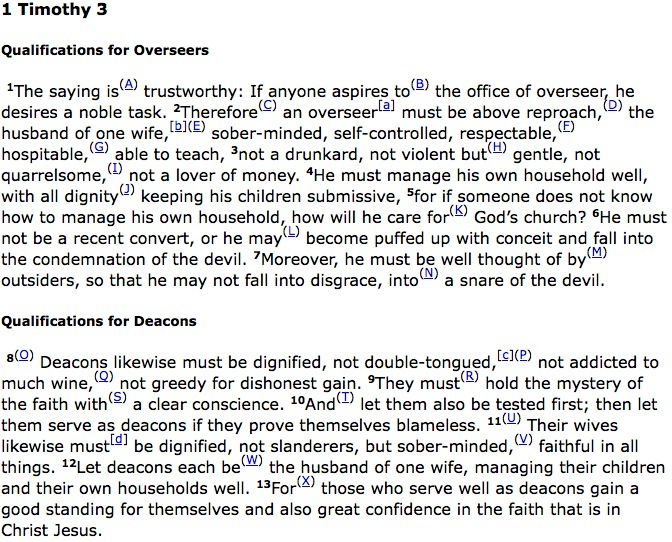 which are essentially listed in 1 Timothy)? Some people argue that if you commit any of these “super” sins at any time in your life, then you are ineligible to be an Elder or Pastor, due to being not above reproach. Others argue that it is ok if you commit these sins before your vows as Elder or Pastor, but not after. And still others argue that Grace covers all these sins so that even after committing these sins as an Elder or Pastor there is a chance, although slight, that one might eventually be able to be an Elder or Pastor again. Personally I do not think Scripture is clear in support of any of these sides, thus we must appeal to something else and Scripture at the same time. This entry was posted in Blog, Religion on October 29, 2010 by coramdeo.